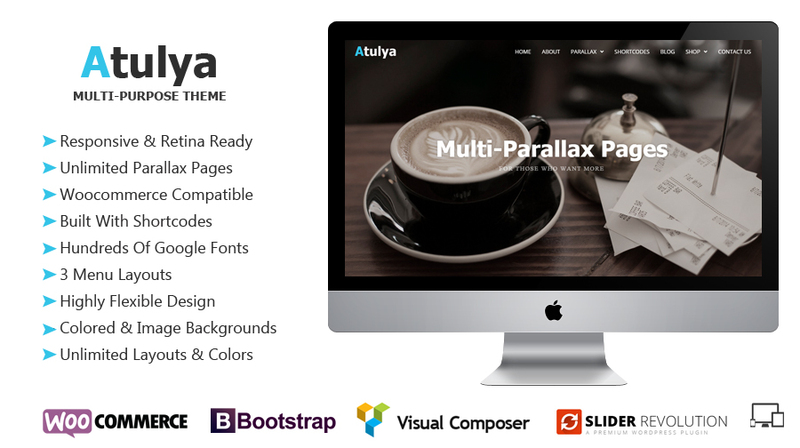 Atulya is an amazing multi-purpose WordPress theme with a clean,minimal design. With ‘Atulya’ you can create multiple parallax pages, a feature most other themes do not have. It is responsive and compatible with modern browsers. This multipurpose WordPress theme is great for building corporate websites, product landing pages and ecommerce websites. It is compatible with ‘WooCommerce’ and most other popular WordPress plugins. ‘Atulya’ comes in 3 layouts, menu on left, menu on top and menu on right, making it suitable for creating a large variety of websites. It is built with Bootstrap framework. And it comes bundled with ‘Slider Revolution’ worth $18. ‘Atulya’ multipurpose WordPress theme assures great viewing experience on any device whether it is your iphone, ipad or desktop. Want to build a site with menu on left or right rather than on top? Atulya multipurpose WordPress theme makes it possible to create websites with menu on left, menu on top and menu on right page layouts. We made sure that our wordpress theme looks awesome on any screen resolutions. ‘Atulya’ uses front-awesome icons instead of icon images and Google Fonts to ensure that the website looks stunning on any resolutions. Atulya comes with detailed documentation and demo contents to make sure that you can easily install and set up your website. You can add animation effects for any column of the website. It works with Animate.css and you can select more than 50 animation effects. Atulya multipurpose WordPress theme comes with a powerful but easy to use theme options panel built with ‘Redux’ framework. This is very user-friendly and enables you to customize different aspects of the website like fonts, layouts, color scheme and more. Our theme options panel comes with a color picker with which you can choose ‘ANY’ color as the theme color. This make it VERY convenient to use a color that matches your logo. Most multipurpose WordPress themes allow creating only one parallax page. But Atulya allows you to create any number of parallax pages whether it is for your home page, about page, product page or service page or any page. This makes it possible to create MORE than one LANDING PAGES for your products. ‘Atulya’ works with the most popular shoppiong cart plugin for WordPress;Woocommerce. This allows you to create an online store for your products on a regular company website. Atulya multipurpose WordPress theme works well with all the latest browsers. Our multipurpose WordPress theme lets you change menu background color and font color. It also allows you to make the menu TRANSPARENT, a feature which makes it possible to display a FULL PAGE SLIDER. Atulya myltipurpose WordPress themes comes bundled with Slider Revolution worth $18 to full take advantage of our awesome features. Create awesome slide shows within your website. Shortcodes are an important part of ‘Atulya’, the whole theme is built with shortcodes. This giives room for tons of customization options.